Spring Break Requires families with children for THIS GREAT FAMILY DEAL contact us 281 222 0432. Minimum Night stay flexible. Spend your next vacation at this beautiful 2 bedroom condo called "Kite Tales". It is beautifully decorated with all of the amenities you would expect in a luxury property. Custom decorated with all of the coastal charm you come to South Padre Island for. The condo features two beautiful King bedrooms 3 full baths and additional guests can sleep in the convertible sofa adjoining the third full bath. Enjoy the views from the living room, kitchen, and dining area of the beautiful Gulf of Mexico. 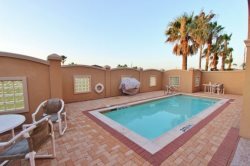 This condo has large front windows and a large deck with lovely lounging furniture and a dining table. You can spend hours relaxing here day or night. All of the modern conveniences you would expect are included. Wi-Fi TVs DVDs . The kitchen features Granite stainless steel purified water at the sink and in the refrigerator. You also have amazing bay views with the bridge and sunsets from both of the bedrooms with decks and large windows to take in South Padre Island scenery. This is a gated resort and has a private beach access swimming pools hot tubs tennis courts and more. Our oceanfront property is perfect for your next vacation. You will love our South Padre Island condo with Texas size amenities and five star quality hotel in this beachfront resort. Great beach rental and wonderful views!! The condo has fantastic beach and bay views. Sunchase Mall located in the front of the property. The mall offers retail stores, boutiques, and coffee shops. Fine dining is available within walking distance. Enjoy the many attractions in the area including the Schlitterbahn Water Park Resort, fishing, shopping, golfing and much more.